This is a dream come true for people in Bengaluru. 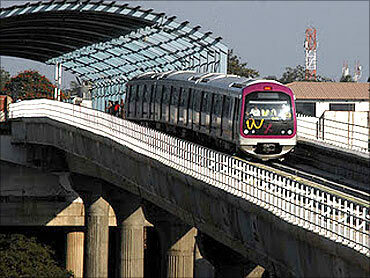 The IT capital's much awaited in metro rail service, 'Namma Metro' started operations on Thursday. 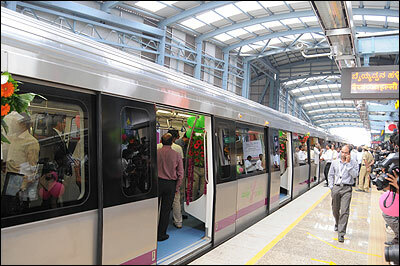 The much-awaited Rs 6000 crore metro rail was flagged off by Union Urban Development Minister Kamal Nath and Railway Minister Dinesh Trivedi in the presence of Karnataka Chief Minister Sadananda Gowda. 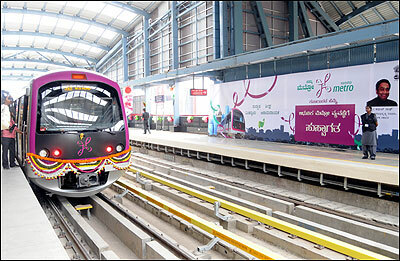 The ambitious Rs 6000 crore (Rs 60 billion) Bangalore Metro project will put an end to traffic woes in the city, making travel much easier and comfortable for commuters. During the first phase at least 20,000 people are expected to use this service on a daily basis. 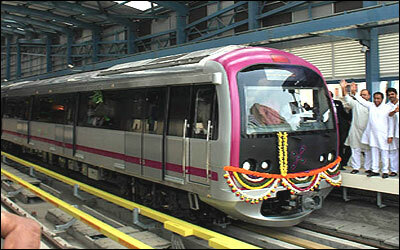 The metro would pass through Trinity circle, Ulsoor, Indiranagar and Swami Vivekananda Road. 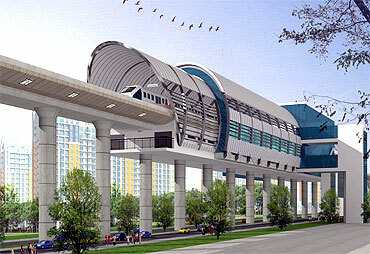 Image: Bangalore's swanky metro rail. 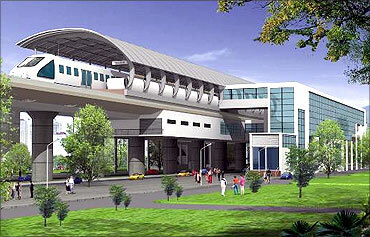 The metro rail would stop for 30 seconds at each station and the frequency would be 10 minutes. 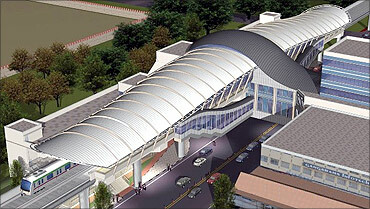 The train would be in service till 10 p.m. and the ticketing counters would be open until 9.50 p.m.
Services would commence at 6 a.m from October 21. The next phase will be a 42 km network on the East-West (Byappanahalli-Mysore Road Terminal) and North-West (Hesarghatta Cross-Puttenahalli Cross) corridors with 41 stations. 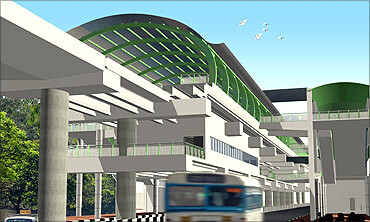 Residents hope that the introduction of the metro would ease congestion as Bangalore has been notorious for traffic jams. The services of the buses in the city are also likely to come down. 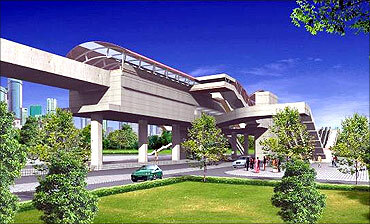 The government would encourage people to use the metro to reduce traffic on the roads. 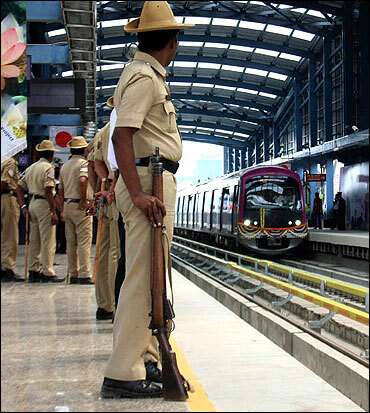 The Bangalore Metropolitan Transport Corporation and the Bangalore Metro Rail Corporation are working together to introduce a common pass for both the services. 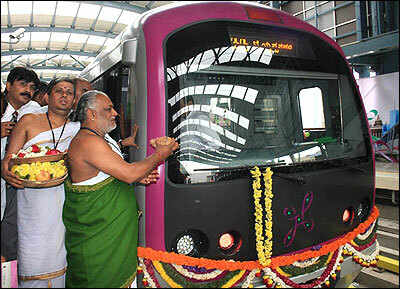 Meanwhile, crowds thronging in to catch a glimpse of the metro rail on MG Road. It has become more of a tourist attraction and people are eager to take a ride. The run-up to the inauguration has not been a smooth affair. After Prime Minister Manmohan Singh laid the foundation stone in 2006, there have been many a legal battle before the High Court opposing the project. However, it was cleared by the High Court. In addition to this delay, the deadline was also missed four times. It was supposed to be inaugurated on 26 September but again postponed to 20 October. In fact the inauguration was to take place on March 2010, but due to various issues such as security clearance it was delayed. A ride from Baiyappanahalli to MG Road will cost Rs 15. 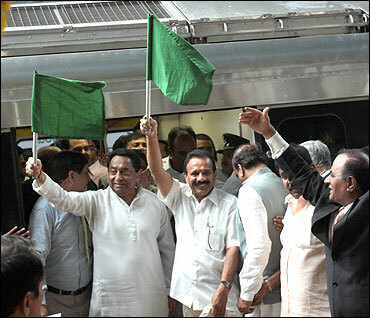 Image: Kamal Nath flags off the Metro rail. Around 20,000 smart cards have already been sold, besides 3,000 tickets. 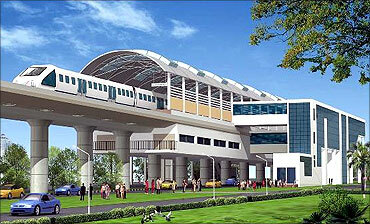 The number of passengers expected to travel on the metro everyday is estimated 16.10 lakh by 2021. Each train will consist of three coaches (2.88 m wide) to start with. 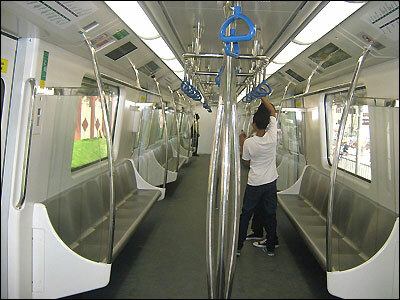 The train can accommodate a total of 1000 persons. The trains will be Wi-Fi enabled, so passengers can use laptops on the move. The train will have light weight modern coaches. Later, it will run six coaches - the carrying capacity of a six coach train will be 2068 passengers. Passengers will also be able to communicate with the staff through a speaker system in case of an emergency. The coaches with stainless steel covering are air-conditioned and have automated doors. 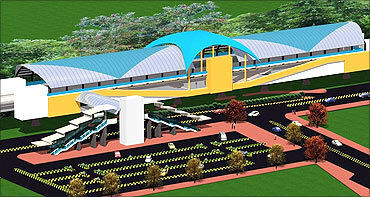 The East-West corridor will be 18.10 kilometres long, starting from Baiyappanahalli and terminating at Mysore Road terminal, going via Swami Vivekananda Road, Indiranagar, Halasuru, Trinity, Mahatma Gandhi Road, Cricket Stadium, Vidhana Soudha, Central College, Majestic, City Railway Station, Magadi Road, Hosahalli, Vijayanagar and Deepanjali Nagar. 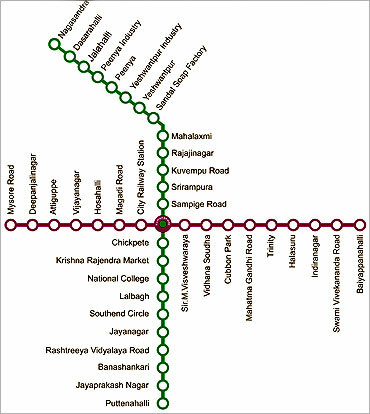 The 24.20 kilometres North-South corridor will begin at Nagadandra and terminate at Puttenahalli going via Mahalakshmi, Rajajinagar, Kuvempu Road, Malleswaram, Swastik, Majestic, Chikpete, City Market, KR Road, Lalbagh, South End Circle,Jayanagar and Puttenahalli. Out of the 42.30 km, 8.822 km. will be underground near City Railway Station, Vidhana Soudha, Majestic and City Market and most of the rest will be elevated. 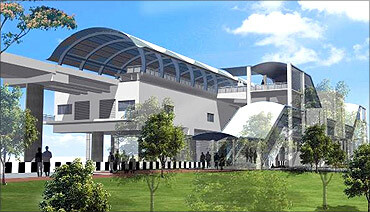 The construction work for Phase-1 of the project was scheduled to start in 2005 but was delayed as government changed in Karnataka in February 2006. 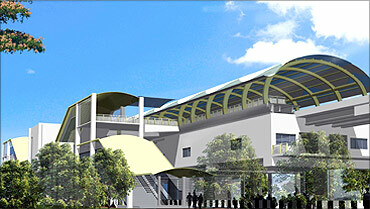 The project's feasibility became a bone of contention. 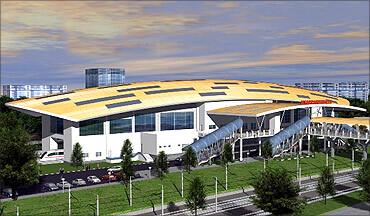 Finally, on 25 April 2006 the Central approved the project. 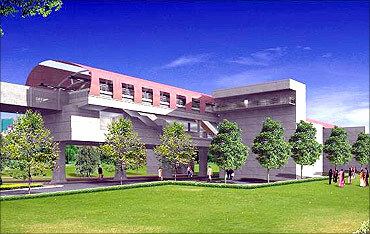 Initially, it was budgeted at more than Rs 5,400 crore ($1.2 billion). Later, it was revised to Rs 11,609 crore ($2.59 billion) crore for phase-I. 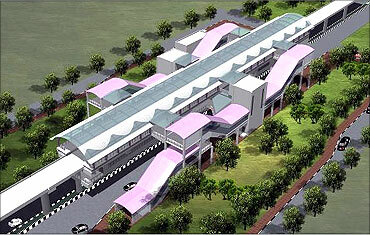 Image: Sandal soap factory station. Covering a span of 70 kilometres, phase II is an extension of all the four Reaches (Reach 1 to 4) and is expected to reduce road traffic by 35 per cent. 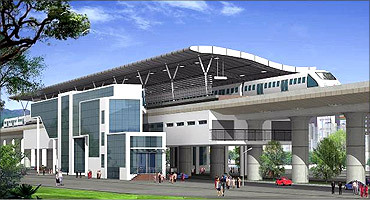 Additionally phase II will also have two independent lines – one from Jayanagar to Electronic City and the second from Nagavara to IIM-B, a total of 21 km of which around 15 km will be underground route. 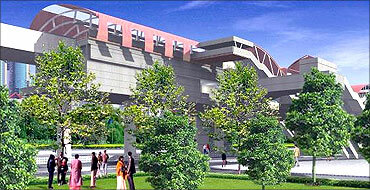 The estimated project cost for Phase II is around Rs 25,000 crore ($5.58 billion). 36 cities that will shape India's future!